Jesus is the mediator between us and God, and by His shed blood we are now able to enter into the holiest place where God dwells in a new and living way for this is the new covenant that has been made with man. (Hebrews 10:16-23). 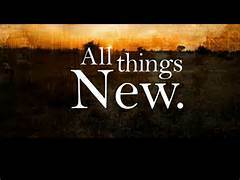 We are to put on the new man that is now created in righteousness and holiness, even our conversation in Christ is new and ministers grace to those who hear His message. (Ephesians 4:21-30). If so be that ye have heard him, and have been taught by him, as the truth is in Jesus: That ye put off concerning the former conversation the old man, which is corrupt according to the deceitful lusts; And be renewed in the spirit of your mind; And that ye put on the new man, which after God is created in righteousness and true holiness. Wherefore putting away lying, speak every man truth with his neighbour: for we are members one of another. Be ye angry, and sin not: let not the sun go down upon your wrath: Neither give place to the devil. Let him that stole steal no more: but rather let him labour, working with his hands the thing which is good, that he may have to give to him that needeth. Let no corrupt communication proceed out of your mouth, but that which is good to the use of edifying, that it may minister grace unto the hearers. And grieve not the holy Spirit of God, whereby ye are sealed unto the day of redemption. Even for the protection of His people does He call them by another name, one that is new to us but known of Him. Those on the other hand who stay rebellious and not choose Gods truth will not fare very well and not be able to enjoy the new heaven and earth God will create. (Isaiah 65:2,11-19). I have spread out my hands all the day unto a rebellious people, which walketh in a way that was not good, after their own thoughts; But ye are they that forsake the Lord, that forget my holy mountain, that prepare a table for that troop, and that furnish the drink offering unto that number.Therefore will I number you to the sword, and ye shall all bow down to the slaughter: because when I called, ye did not answer; when I spake, ye did not hear; but did evil before mine eyes, and did choose that wherein I delighted not. Therefore thus saith the Lord God, Behold, my servants shall eat, but ye shall be hungry: behold, my servants shall drink, but ye shall be thirsty: behold, my servants shall rejoice, but ye shall be ashamed: Behold, my servants shall sing for joy of heart, but ye shall cry for sorrow of heart, and shall howl for vexation of spirit. And ye shall leave your name for a curse unto my chosen: for the Lord God shall slay thee, and call his servants by another name: That he who blesseth himself in the earth shall bless himself in the God of truth; and he that sweareth in the earth shall swear by the God of truth; because the former troubles are forgotten, and because they are hid from mine eyes. For, behold, I create new heavens and a new earth: and the former shall not be remembered, nor come into mind. But be ye glad and rejoice for ever in that which I create: for, behold, I create Jerusalem a rejoicing, and her people a joy. And I will rejoice in Jerusalem, and joy in my people: and the voice of weeping shall be no more heard in her, nor the voice of crying.